Nanette Cole: This is a dream... It has to be. Walton: It's more like an eternal waking nightmare, from which there is no escape. I know some Black Mirror fans don't like this episode, but I do (I love it). 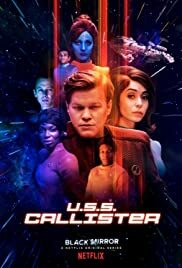 USS Callister is biting commentary on 'reboot-culture', gaming, internet trolls and nostalgia as a whole. This episode is almost like a loot-crate for sci-fi fans who grew up on this stuff (show runner Charlie Brooker did); you can see callbacks to things like the original Star Trek (obviously), the 2009 film reboot, Battlefield Earth, The Matrix, Toy Story, Interstellar, and even Guardians of the Galaxy (at least certain images did that for me). It evokes all these classics while telling a memorable tale in this anthology series masterpiece, showing how 'playing-master' over your subjects, even digital ones, is not necessarily a good thing. For me, this episode is probably the season-best alongside Black Museum and Hang the DJ. Black Mirror is innovative television at its best. 73 of 95 people found this review helpful. Was this review helpful to you?